DeckStainHelp.com has become the Internet’s go-to site for exotic wood deck staining tips. As with all different types of wood surfaces, we recommend you properly prep your redwood before staining in 2019. This involves allowing your redwood to weather for a few months prior to cleaning and brightening. Feel free to leave us a comment with pictures of your Redwood projects if you have them. 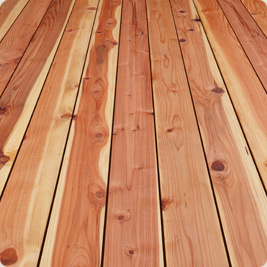 The natural beauty of redwood can make for a gorgeous deck that any homeowner would be proud of. Redwood is not as readily available as other types of wood, which makes it more expensive. But the cost can be justified by the beauty and longevity of the wood. A redwood deck can last for many years. Although redwood is naturally resistant to decay, it can still be damaged by wet and dry conditions, constant moisture, and freezing/thawing in colder climates. A redwood deck should be cleaned and protected with a weather resistant stain every year or so. For help with a new redwood deck, allow the wood to weather for a few months to let the oils dry out (rough sawn wood can be finished right after installation). Prepare the surface with a quality wood cleaner and wood brightener. A two-part cleaning system like Restore-A-Deck works well. Use the wood cleaner and a brush or pressure washer to remove any dirt and mill glaze from the surface. Use the wood brightener to further prepare the wood for new stain. If necessary, you can sand the wood once it dries to remove any remaining mill glaze that may hinder stain penetration. On new smooth redwood, sanding will also help soften the surface for better stain absorption although this step is not necessary. Use a deck stain recommended for redwood. A semi-transparent penetrating deck stain is ideal. This type of stain will enhance the redwood’s natural beauty and eliminate weathering. When staining redwood, it is important to only apply as much stain as the wood can handle. If the stain is not absorbed within 10-15 minutes, wipe the excess off the surface. Apply stain to the entire length of each board before moving to the next to eliminate lap marks. Start with the deck railings, then the deck floor, and any steps lastly. Always follow the staining instructions on the label, as most stain brands will apply differently from each other. 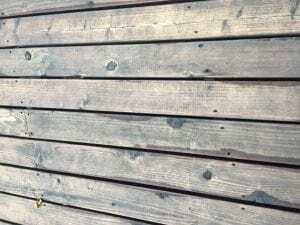 These tips will help with a new redwood deck. Keep in mind that regular maintenance is the key to a long-lasting deck that your family can enjoy for many years. I just bought two redwood slabs that have been milled/plained and kiln dried. He ran one slab through the plainer again a couple of times for me. These are actually going up as shelves in my kitchen, but hoping you could advise anyway. Do I need to wait to stain the slab that went through the plainer again? And anything you recommend doing to the slabs before staining? Thanks so much! I am sorry but this site is based on our experience with exterior wood, not interior wood shelves. You would not use the same products. 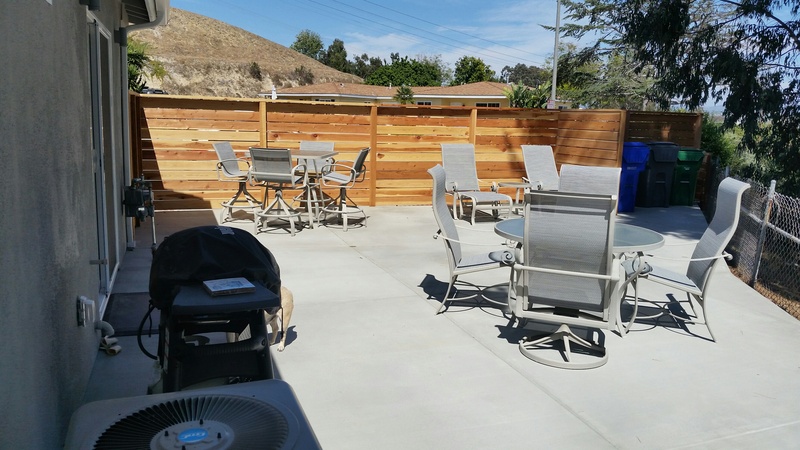 We live in the SF Bay Area and had a beautiful new redwood deck installed last summer. It was stained with Penofin Oil Finish (transparent redwood) which has aged badly and resulted in black patches and discoloration. The natural color of the wood on the deck surface is gone. We are going to re-stain the deck this spring. 1. What stain would you recommend to preserve natural color and avoid turning black? 2. Should we sand and then seal or clean and brighten before sealing? 3. Should we stick with oil-based stain? 4. Is there anything else we can do to prevent discoloration? Thanks in advance — this forum is incredibly helpful. My new cedar wood gate started as rough sawn wood. The gate maker said he then sanded it smooth. I understood from previous posts you can apply semi-transparent stain to rough sawn cedar. Since mine was sanded, do I wait 6-12 months now to apply the stain? Thank you. Wait a couple of months and clean/brighten for the prep. 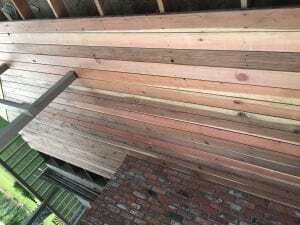 We live in Northern California and are building a 16’x30’ redwood deck, using kiln dried 2×6 redwood heartwood for the top. There’s lots of info out there, and I want to clear up a couple questions. The deck will see direct sun for approx half day. We’re also looking into a pergola (covering the deck), but are still undecided. 1. Is use of water based stains ok? Or do you only recommend oil based? 2. I’ve been told because top boards are kiln dried, we do not have to wait to stain. Thoughts? 3. If we do decide to add a pergola, would that change stain recommendations? Thanx for the help and we appreciate your time! 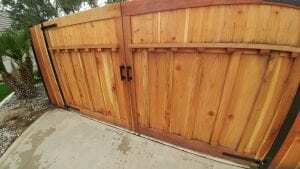 I just had a redwood double gate made and installed about 4 weeks ago. I was told to wait a few weeks to let the wood dry out before sealing it on one side. I didnt get around to sealing it and the rains came and now there are black streaks all over the gate. Is it mold and how can I remove the black. I am in central Calif and its still raining. That is mildew. You will need to clean and brighten to remove. Stain with Defy Extreme or Restore A Deck Wood Stains after. Yes, you should wait until Spring to clean and prep. Having a redwood deck installed right now in the Colorado front range. Would like to keep that natural finish and want to protect the wood. We are rapidly approaching winter months. Everything I’ve read here is to wait a few months to stain. My builder suggests Pinofin for redwood and says stain it right away and don’t let 4 months of snow and cold damage the new deck. With temperatures low, my earliest time if I don’t stain now will be April in 4 months. Is it okay to wait that long or could I stain right after it’s built to protect my investment? Wait until Spring and do not use Penofin. It has a tendency to turn black. Just finished building a new cedar deck. I was told to finish it with Varathane lineseed based oil? Your thoughts? No, that will ruin it. Let it weather for a few months, clean and brighten for the prep, stain with a penetrating deck stain like Armstrong Clark or TWP wood stains. 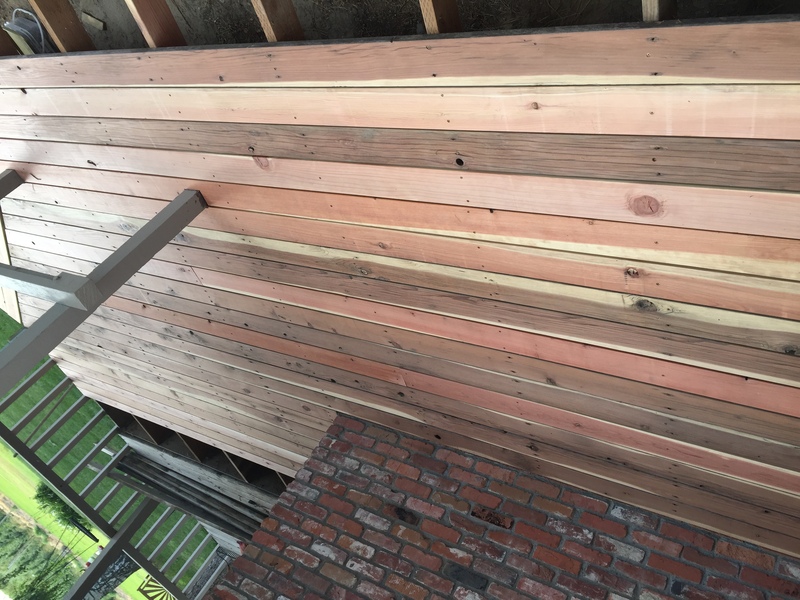 We removed 25 year old redwood planks from our deck, turned them over and planed the underneath side, then put them back down. We plan on staining them–would you advise differently given that these are the old boards (they look new and awesome!). Treat them as new wood. Weather and prep. I have nearly the same situation. I am looking at the Sikkens stains. Should I use SRD or DEK? Also, the Sikkens instructions appear to say to use TSP+bleach, rinsed with a pressure washer, even for new wood. That sounds crazy to me. Do you really want to wash newly planed lumber before applying the stain? 1) Should / can I use a wood brightener or conditioner on the the cedar and redwood? I’ve tried staining the redwood and the lighter areas look blotchy. 3) Should i seal both sides? Clean and brighten the wood for prep and to remove the mill glaze and open the grain of the wood. Penofin turns dark or black after time. Try the TWP 1500 Series or Armstrong Clark. No need to stain all sides. Just exposed wood. Great thx so much. What cleaner or brightner do you recommend? Restore A Deck Cleaner/Brightener Kits. A few days of drying will be fine. No advantage to doing that. I have an untreated/unstained 9 month old redwood deck in Reno, NV (temperature extremes, dry climate). I plan to clean and then stain the deck next spring. Since the deck is already built, I can only stain the top surface. Will this cause the boards to cup? No, and you are only supposed to stain the exposed surfaces, not all sides. I have a redwood deck in California and every 7-8 months I have to keep buying a stainer but it don’t last long. What product or solution do you recommend? Strip all the current stain off and brighten the wood after. Make sure you have bare wood and then try the Restore A Deck Wood Stain or Armstrong Clark. We are having a new redwood deck installed to replace our old one. The builder advises us to staining all 4 sides before he installs it. We would be using a Sikens stain product. There would only be a few days laps between staining & installing. We live in the Colorado Rockies..so our climate is pretty dry. Our thought is ti stain the back & sides.. then finish the top after instillation. 1. is it advisable to stain all 4 sides? Will that help or hinder the wood? 2. Is this too soon to stain raw wood? What effect would it have? 3. Re we on the right track?? Any suggestions and information to help us with is project is much appreciated!! 2. Yes. Probably will prematurely fail. Might want to read the Sikkens SRD instructions. Per your suggestion, talked to Sikkens regarding the SRD product and was advised, because the stain is permeable, it is fine to stain all 6 sides of a board. Said to let the new wood dry out after purchase for a couple of days in our low humidity atmosphere (we’re at 9,000 ft with a 20-30% humidity) before applying one coat of the stain. The new stain needs to cure for 7 days before the wood is attached to the deck joists. Appreciate your feedback. We have a new rough sewn redwood fence that we just put up, it is beautiful with lots of variation in wood tones. We don’t want to loose that but want to use Defy to protect the fence. We got samples of Cedar and Light Walnut, they are very small samples (1 oz) and they seem exactly the same. My fear is that the Brown tones will be very uniform and we will loose all of the variation in the Redwood. I think the Pine would be too yellowing. Can you comment on the differences between these two stain colors, and if you think we will still see lots of variation with the Cedar or Light Walnut stain? Thank you! Both colors enhance the natural grain of your wood tones. Personally, we like the Light Walnut better as it is not as “orange” as the cedartone color. We tried the samples of both Defy Cedar and Light Walnut. The Cedar was sort of peachy on the light wood, as you mentioned. The Light Walnut to us seems to just brown over the pretty color variations in the wood. We would like to keep visible as much of the pretty/different tones of the wood as possible while still having the protection of a semi-transparent. What can you recommend? Have you seen and can you describe the Natural stain color of Restore-A-Deck? I wish Defy had more options…it sounds like that stain has been out there a lot longer. There are many more reviews on Defy, and only 6 reviews of RAD on Amazon. 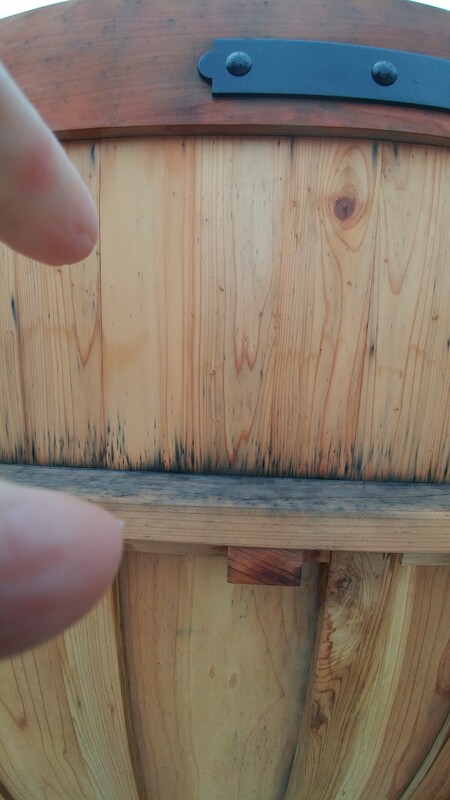 Btw we cleaned and brightened this wood 2 weeks ago. It is rough sewn. If we stain it a week or 2 from now, will we need to Re-clean or Re-brighten in any fashion? Or just go ahead? 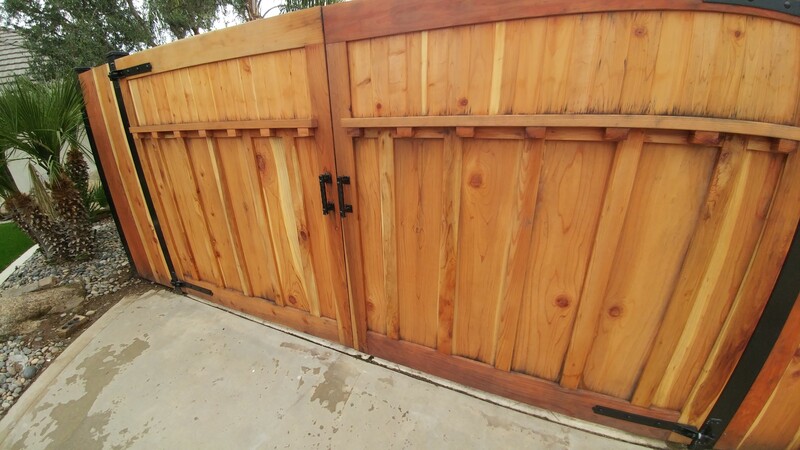 By the way, the gate looks much darker than it is (maybe the angle or it being in the evening), but it is actually the same wood and color as the fence. Thanks! Staining this within 2 weeks of the prep will be okay. The Natural color of the RAD will enhance the grain similar to as if wet with water. Our new Redwood deck refuses to absorb the stain. Your article about how to apply was helpful. It’s a day later and some parts have not absorbed. Is it too late to wipe down? Turn the board over and try proper applying? We are hundreds of dollars into staining, sanding tried another brand of stain. Remove the stain that is currently on there. Let the wood season exposed for 3+ months. Lightly clean and brighten the wood. Do not sand. Use a penetrating stain like the Armstrong Clark. In reading through these posts, I gather that Behr is not a favored product. Can you say why? I was thinking that, if I purchased a better, more expensive product like those you’ve recommended, I wouldn’t have to refinish my deck every year, but above, you say “A redwood deck should be cleaned and protected with a weather resistant stain every year or so.” I’ve very much appreciated all the advice as I’ve read through these comments and have learned a great deal … so this isn’t a critical question. I’m just curious. Thanks! Read our review on the Behr and the customer comments below the review. Semi-transparent penetrating stains are ideal. In reading these comments it is stated that the tint provides the UV protection. We are redoing our redwood deck using both old (planed), and new boards. We like the look of the wood and how it is turning out, but if we used an un-tinted stain, it would quickly turn grey if I understand the prior posts. Have you ever seen a semi-transparent grey toned stain on redwood? This is a consideration, but are not sure what it would look like. Insight appreciated! Thanks. Yes, you can use a semi-transparent gray. Armstrong Clark makes a Driftwood Gray. We have a 5 year old redwood deck and took all the boards off and sanded and put back. Mostly using the other sides of the boards. We had to replace a few of them with new boards. How long should we wait to stain? We’re planning on using a solid stain to last longer, is this good for redwood? Wait a few months and then clean and brighten the wood for the prep. What about refinishing old decks what is a good stain. Just built kiln-dried redwood picnic table. We want a good stain that will make it looked like a gray weathered wood. What color and brand would you recommend? Try the Armstrong Clark in Driftwood Gray. I just tried a semi-transparent redwood stain on one fence post on my redwood fence. It takes away the natural color of the redwood and does stain the wood red. Not pretty but I guess that’s why they call it “stain”. What should I put on my fence and deck if I already like the natural color but want the protection? It is an impossibility to retain the natural color without having a stain or tint in your coating. The tint is your UV protection from graying. Using a “clear” with no tint, will not protect against graying. I just had a redwood fence built in May. The person that built it sanded all the wood after it was installed. 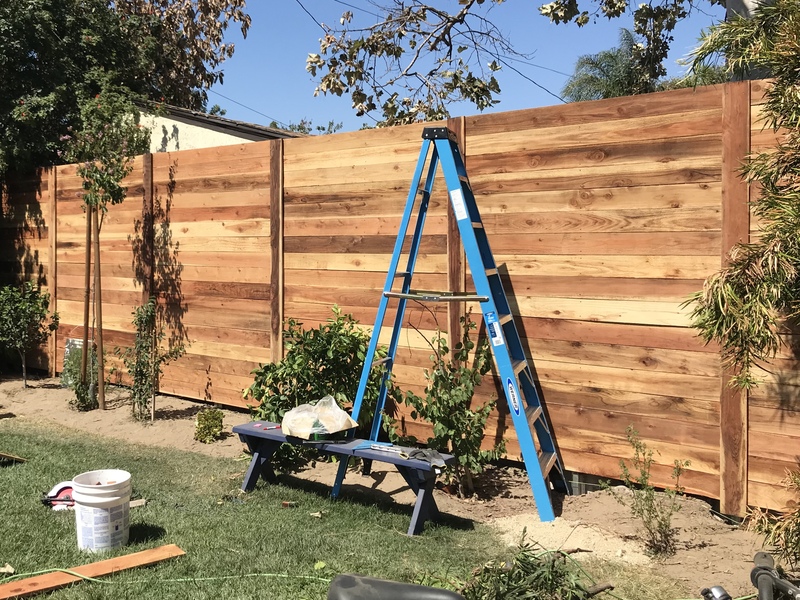 I want to protect the beauty of the fence so everything I’ve read on your site is I should use a semitransparent stain? Should I wait longer or stain it now. I live in Southern California the fence faces east so the front gets full sun till noon-ish and the inside of the fence gets sun the rest of the day. What would the best stain I should us. I would be doing this myself and never worked with wood before but up for the task. Wait another month or two and lightly clean for prep. Stain with TWP 1500 or Armstrong Clark. Hi, We are also in So Cal and have the SAME fence as above. Can I clarify you are suggesting a clear wood preserve instead of a semi translucent stain? TIA! No. Use a semi-transaprent for best results. 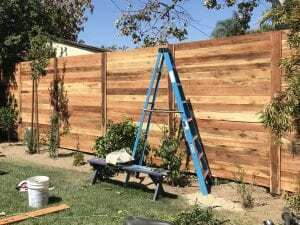 I’m also in So Cal and just had a contractor install a new Redwood fence. Would a Semi Transparent Oil-Based or Water based be better? Also what grade or sanding do recommend to smooth off dirt? Either would be fine. Clean and brighten the wood for the prep, do not sand. I’m planning to put semi transparent oil based stain on my garage redwood (sapwood). Do I need to apply polyurethane oil based? I read somewhere that poly may crack or peel. Should you only use stain on redwood or use a sealant? Try TWP Cedartone or Armstrong Clark Semi-transparent Cedar. Can any of the deck stains be applied with a sprayer? I am installing a new redwood deck can I stain it before I put it down.? or once I put it down can I stand it right away after that? This will vary based on the brand of stain you will be using. Best to folow their directions whne it comes to new wood. Did you choose a stain brand yet? After reading most of the comments below, I am still confused. I just installed a redwood fence, Ridge & Valley Redwood Fence Picket, from Homedepot. Can I stain it now or should I wait? What should I use to stain it? I bought the semitransparent water based stain from Behr. Great information. I will do so. One more question. 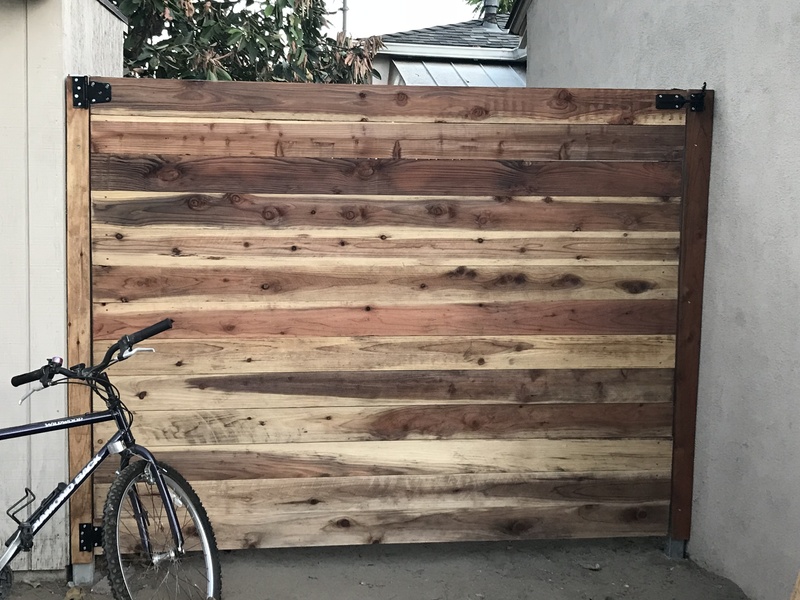 On the other side of the house, I have a weather fence (still in good condition) that I would like to stain so the color/look is similar to the new one. How can I get rid of the weather look? 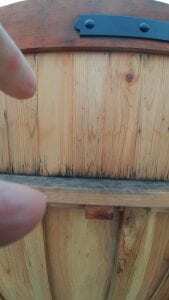 Should I use the same stain on both fences (new and old)? You can use the same for both. As for the prep, use a Restore A Deck Prep Kit with pressure washing to remove the graying. Silly question. We’ve decided to replace all the wood boards on our deck w/ new redwood ones. Is it necessary to stain and seal both sides of all the boards before installing? Hope I make sense. No need to stain all sides. I am installing a Redwood deck (September). Live in Reno, NV…deck will have sun 10am until dusk. I am reading all the comments over the years on this thread and it sounds like I should wait until spring to seal/etc? Never know when the rain, snow, cold temps will happen. Also, you mention Armstrong Clark, TWP 100 series, Defy Extreme…what are the differences and what do you suggest I use? I want to keep the redwood color. Thank you so much. 99% of the time decking boards are smooth cut. Wait and prep according to the stain manufacturer you choose. Hi, We found dry rot in a support beam, (old growth redwood), *under our deck and one other beam that sounds solid but has one small area that is slightly soft. Will have the support beam replace but I’m not sure what to do with 1) the second beam and 2)the white fungi I can see beginning to grow under the deck. One person says fungi is ‘nothing to worry about”, another tells me to “spray with copper nitrate”, a third says clean it off then spray with a protective coating (TWP)”. Perspective…? We would try and kill and clean off the fungi and then leave unstained for the beams. I’m looking for recommendations for the best sealer for a brand-new kilndried redwood deck. I live in the Willamette Valley in Eugene OR. Try TWP or Armstrong Clark brands. We just finished building a pergola made from treated red wood. We live in New Mexico, where the humidity is usually 30%. How long should we wait before we stain the wood? D0 we need to use a cleaner & brightener. Im gonna ask Home Depot is the wood is “Wet” treated, my suspicions. Also, the stain, should it be a semi oil one? We live in New Mexico, where it is very dry. We just finished making a Pergola out of treated wood. Should we wait 6 months before staining? What is a good product for staining for New Mexico? Yes wait a little while. Try Armstrong Clark or Defy Extreme Stains. Hi. Thanks for this site and your wisdom. I have a 30 yr. redwood deck that was maintained regularly until the past few years, (not sure what product was previously used). Do you suggest a power wash and sanding? Oil or water based stain? Also, should I replace popper nails with screws? What is best deck stain/sealer allowed in California? Try Armstrong Clark or TWP 1500 Series. 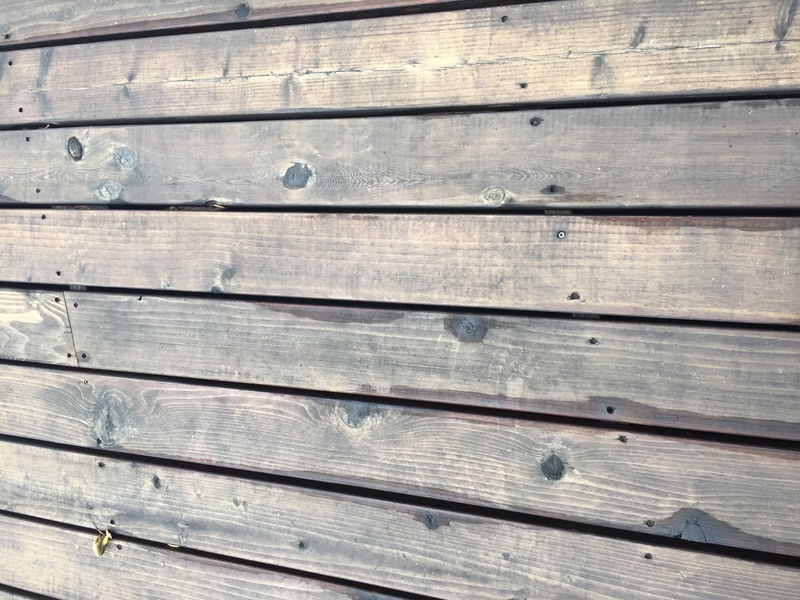 Can I stain over stain….if so, should I use the same brand that was originally used on my redwood deck? Only stain over if using the same brand and color. If swithching brands you should remove the previous coatings. I just removed the old finish off of the redwood railing of my porch, sanding it down to the raw wood. I’d like to make it look more like walnut, maybe a little lighter. Is this possible? How should I do it? Thanks! Try Armstrong Clark in Natural Oak color. Ok Thank you! Maybe I should clarify the color. I meant for of a black walnut color, but a little lighter. Still the Natural Oak? That looks a little light for what I’m going for. They have a nice Black Walnut if you want a darker color. I’m ready to install a new redwood deck after finally completing the foundation/joist repairs. I live in Hawaii on the windward side of Oahu. We get both a lot of sun, low 60’s to mid-90’s all year, and quite a bit of ra although nothing like the NW on the mainland. Planning to use a transparent stain after cleaning and brightening. Since weather is pretty consistent here, should I wait for the deck to “weather” or can I prep and stain right after laying the boards? We would let it weather and prep first. Best though to follow the directions of the stain brand you end up choosing. Did you remove all of the Olympic with the prep? Using a penetrating semi-transparent stain is the way to go. Try TWP or Armstrong Clark. BTW, nothing lasts 6 years. 2-3 is the most you will get on a horizontal surface. new redwood deck installed this week. we would like to keep the look of the wood. should we just seal or seal and stain? semi-transparent oil based stain but what color tint to keep the redwood look? All semi-transparent colors will change or ehance the grain and you must have a colored stain if you want UV protection. Best to try some samples before applying. Look at Armstrong Clark or Defy Extreme. Redwood deck is 35 years old.Seven years ago I took the deck apart and had all the boards planed. They were beautiful. Just finished cleaning and power washing . Used defy Brightner on the deck. This is Northern Iowa. long ,cold, lots of snow, winters. Is an oil base stain the best choice? Sure an oil based semi-transparent will work. Try TWP 100 Series or Armstrong Clark. We put down new redwood on our deck..them it rained…do we need to let it dry before we stain it? Yes and prep as well. have installed a brand new redwood fence. when to apply thompsons water seal? If rough sawn cut you can stain now as long as it is dry. If smooth wood, you will need to wait and prep. 3-6 months. FYI, Thompsons is useless. Has no UV protection. putting up redwood fence in southern california close to the beach. i want to keep the original color of the redwood i.e. as light as possible. protect it from weathering/changing color. prefer to be safe for the ecology. please advise of which products would be best. thank you ever so much. Look at Defy Extreme in Natural Pine or Armstrong Clark in Natural Tone. I just finished an outdoor storage box made of kiln-dried, s4s redwood. Do I still need to weather it? Would you suggest an oil-based, semi-transparent like the Armstrong? What colors are best to get a natural looking reddish tint without going overboard? Great website, thanks! Yes it is fine to install and wait to stain. Make sure to prep before staining with a deck cleaner and a wood brightener. Depends on the brand. Below 50 is pushing it but can be done if applied well. we been having very mild weather lately so yesterday, I put redwood stain on my deck not knowing that the temperature was going to drop drastically overnight. It's still wet in some areas, especially off the patio door. I was going to apply water sealer today, but as I said, I didn't know that the temperature was going to drop drastically. What can I do? First of all, you cannot add a deck sealer over top of a deck stain. No need either. Just leave the stain alone alone and hope it dries correctly.